The Alienist Review - Daniel Brühl May Finally Get Recognition He Deserves - Are You Screening? 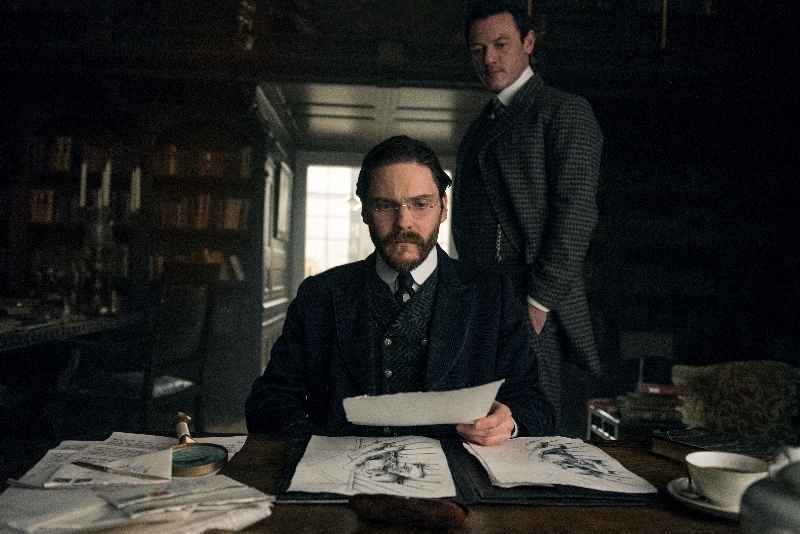 The Alienist reminds of several other series from recent years that explore period drama, but not because of gaslight and grime. For whatever reason, though these shows are all (more or less) looking to explore a period of depravity and crushing dreariness, there is apparently something about the effort to sell period drama to today’s audiences that leads to richer characters and a sharper focus on them. Daniel Brühl stars as Dr. Laszlo Kreizler, an alienist, which the show explains is the term for what would become forensic psychologists (sort of). While the idea of forensic psychology may explain the general realm of what Dr. Kreizler aims to accomplish, because he is doing it during a time in which he is inventing the field there is little about his work that comes easy. The show revolves around the case of a serial killer… maybe, and trying to get himself involved in the truly gruesome crimes means that Dr. Kreizler requires the aid of John Moore (Luke Evans), an illustrator, and a family friend of Moore’s, Sara Howard (Dakota Fanning), who happens to work for the police. While the show is wonderfully written and throws viewers deep into a multi-faceted world of New York City at its best and worst, the power of the show comes from the fact that it examines Dr. Kreizler himself at least as much as the case(s) that drive him. It isn’t simply an introduction to a unique sleuth, as might be the case with something that hopes to evoke a Holmesian hero, but an investigation into that sleuth. We aren’t “along for the ride,” as Moore “Watsons” us through the workings of Kreizler’s mind, but watching as he tries to figure out what he’s doing. In a world that isn’t even particularly interested in psychology in any form, and doesn’t have a way to reference serial killers, Kreizler is making up most of his theories and ideas as he goes, based on the scant evidence and experience possible, and what seems to make sense to him by virtue of trying to imagine the mind of the criminally insane. Even describing that approach gives a skewed view of the show, because that’s an approach that makes sense now. But, that isn’t really what Brühl is tasked with delivering here, because he has to portray confidence in his abilities while also demonstrating that he’s flying blind and wildly in the face of the world around him. Where Holmes would tell you what you had for lunch last Tuesday by looking you up and down, and thereby solve the crime, Kriezler is mostly guessing that such and such crazy person would believe so and so, but he isn’t sure what that gets him anyway. Like other period series that have succeeded in creating addicting, entertaining characters (Harlots comes to mind), The Alienist does everything it can to make New York City a character and it manages to do so by giving it so many voices. From the poorest neighborhoods and crooked cops to the pasty finery of the upper class and the pell-mell hansom ride from one to the other, the city is alive and the characters could not seem more at home in it. Though not for the faint of heart in more ways than can be mentioned, this is one that will grab hold of anyone who likes a good mystery and loves to pick apart a character as much as an investigation.